By buying this product you can collect up to 5 loyalty points. Your cart will total 5 points that can be converted into a voucher of K.D. 0.250. The DTX Minnow is a revolution in trolling minnows, featuring the Nomad Autotune, Hydrospeed, Diamond Armour and Gorilla Through Wire advanced design technology. The pat. pending Autotune system was designed over years of testing and is a revolution in lure technology that will be applied to all deep diving lures across the Nomad range into the future. The Autotune design provides for 2 key features – maximum diving depth, and the ability to ensure the lure always swims straight. The pat. 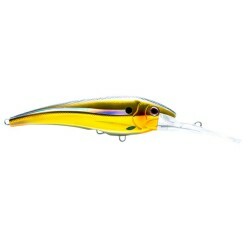 pending Autotune system developed ensures that no matter how many fish you catch, the lure will keep swimming straight. During testing we had lures still swimming straight after catching over 50 fish. Another key feature of the Autotune system is the amazing diving depth. The ability of the system to perfectly center itself every time on the bib means that the tow point can be pushed as far back on the bib as possible, effectively just forward of the point where the lure becomes unstable and won’t swim. However, having the tow point as close to this “point of not swimming” is what achieves maximum diving depth, but it can only be done with a perfectly centered tow point. 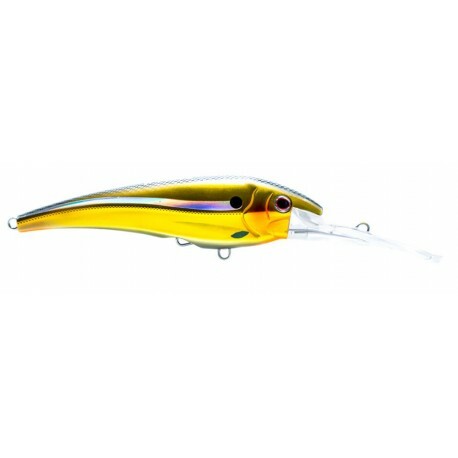 The DTX 85-140 models are designed to float with a different bib shape and wider body. These sizes are designed for more action at slower speeds, while still being able to handle high speeds. The Autotune system also imparts more action and wiggle on the lure body. The smaller DTX minnows are amazing casting lures and will crash dive very deep, quickly and are easy to work over structure. The concealed Hydrospeed belly eyelet allows faster trolling speeds with single hooks, and ensures the lure is balanced with single hooks, so the DTX minnow keeps swimming straight and true. The additional belly eyelet in front of the Hydrospeed eyelet is designed to be able to fit an assist hook when targeting large tuna and marlin.